The Aegean Bronze Age is predominately known as the period in which the battle-hardened Mycenaeans conquered the simple sea-trading Minoans and rose to become one of the most powerful trading powers in the Eastern Mediterranean. While the Minoans have long been presumed to be a peaceful race due to archaeological findings (or rather, the lack of military findings), the same has never been presumed of the Mycenaeans. Their artwork, shaft graves, and surviving Linear B tablets reveal a very strong warrior culture not previously seen in the Minoan Aegean. It has therefore often been assumed that the catastrophe that brought the Mycenaean culture to its knees was related to this preference for bloodshed—perhaps by themselves engaging in warfare - the Mycenaeans were seen as a threat by neighboring empires. However, there are numerous other factors that could have brought this warrior culture crashing down—namely a combination of disruption in the social, economic, political, and environmental status quo . This article will attempt to briefly examine these various factors and the role each could have played in the fall of the Mycenaeans. Mycenaean culture was centered around large palatial complexes, in which religion, politics, and economics were intricately entwined. The disruption of one could lead to the disruption of many. Further, this centralization similarly indicates that any amount of division among leading figures could have shattered the Mycenaean order—for example, a shift in governmental power, internal warfare, or lack of attention to religious details might disrupt Mycenae's international trade market, creating a ripple effect. Copper, for example, was highly valuable as a protective element in religious ceremonies; to obtain copper, one needed to be in contact with the Anatolia's Hittite tin trade. Essentially, as Mycenaean culture was so tightly woven around itself—dependent on good relations with neighboring leaders and societies— any amount of internal unrest could negatively affect the Mycenae's primary source of income. Financial devastation in the wake of internal warfare, external invasions, or natural disasters would have made recovery near impossible. While external invasions speak for themselves, theories of the impact of natural disasters on the Mycenaean culture also abound; similar events occurring in contemporary Mediterranean cultures further the likelihood of these events. Specifically, Anatolia (modern day Turkey, in which the mythological Troy existed), Egypt, and the Levant (modern day Iraq, etc.) were damaged by a chain of earthquakes and volcanic eruptions that also rocked the Aegean. This seismic activity appears to have caused a fiery domino effect due to the centralization of each community—oil-burning lights were common in Mycenaean-Minoan Greece, Anatolia, etc., and the consistent earthquakes that rocked the Mediterranean, quite simply, could have enabled these elevated flames to tip over and set fire to the aforementioned palaces. Having the type of communities in which politics, economics, and religion were all focused around singular sites made it far too easy for these fires to almost instantaneously devastate order. One of the most significant instances in which fire is believed to have caused such destruction is the situation at Knossos in Crete. The well-known Linear B tablets, Mycenaean records, and the undeciphered Linear A tablets of the Minoans were likely baked around the time of the collapse, thus preserving them for future decoding. Arthur Evans, the archaeologist who "discovered" the Minoans, presumed that the fiery preservations had been caused by an earthquake which had toppled nearby torches. Whether or not these fires did cause the end of the palatial complex at Crete is still questioned; however, the fiery preservation of the tablets is evidence that the overwhelming fires were very real dangers within these tightly woven communities. One must also remember that the destruction of whole societies does not happen overnight; it is likely that if the fall of the Mycenaeans is linked to a natural disaster, this disaster was the starting point of a foreseeable, dangerous chain of events. The movement of native Mycenaeans serves as another valuable indicator in the constant debate of their eventual collapse. While the evidence discovered at the sites of former palatial complexes indicates that there was extensive burning of various city centers, and the aforementioned seismic activity that likely caused or exacerbated this destruction, there is also evidence that many of these sites were abandoned. The precise reasons behind the Bronze Age Collapse of the Aegean will likely never been known; too many factors working in conjunction with one another could have had any number of negative impacts on the centralized international trade centers of the Mediterranean. The Mycenaeans' downfall, however, might have a light at the end of the tunnel. 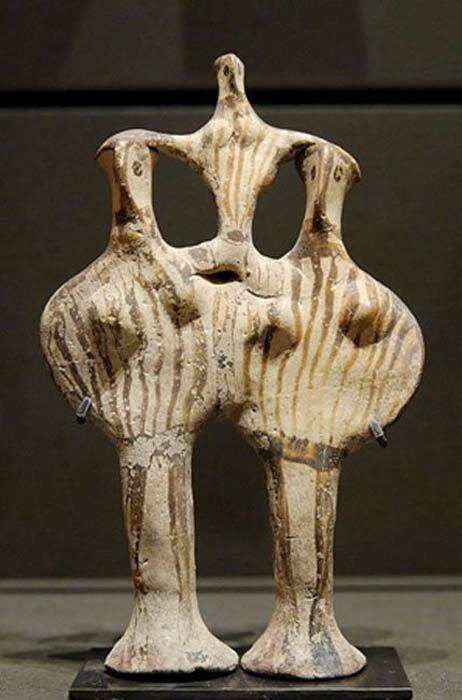 Their extensive borrowing of Minoan art forms, palatial complex structures, and language indicates that assimilation went both ways—the Mycenaeans did not let the Minoans die out. Therefore, should the Minoan Linear A script ever be deciphered as the Mycenaean's Linear B has, records of the end of the Aegean Bronze Age might be discovered. As the end of the Mycenaeans ushered in the Greek Dark Ages, in which Homer's Iliad and Odyssey are the among the earliest texts to break free from this dark period, any surviving information relating to the last couple centuries of the Mycenae in the Bronze Age might lead to a more complete understanding of the factors of its fall. Drews, Robert. 1993. The End of the Bronze Age: Changes in Warfare and the Catastrophe ca. 1200 B.C. Princeton University Press. Gutenburg, B. and C.F. Richter. 1954. Seismicity of the Earth and Associated Phenomena. Princeton University Press. Knapp, Bernard and Sturt W. Manning. 2016. "Crisis in Context: The End of the Late Bronze Age in the Eastern Mediterranean." American Journal of Archaeology . 120.1. pp 99-149. Laffineur, R. and Emanuele Greco, eds. 2005. Emporia: Aegeans in the Central and Eastern Mediterraean: Proceedings of the 10th International Aegean Conference Volume 1. Université de Liège. Laffineur, R. and Emanuele Greco, eds. 2005. Emporia: Aegeans in the Central and Eastern Mediterraean: Proceedings of the 10th International Aegean Conference Issue 25, Volume 2. Université de Liège. Sandars, N.K. 1987. The Sea Peoples: Warriors of the Ancient Mediterranean 1250–1150 B.C.E . Rev. ed. Thames & Hudson. 1. Pre-thera Ape bones and Egyptian jewellery found in the British Isles (trade items for Tin). 2. Linear A inscribed on a Scandinavian silver mine. They were sending expeditionary missions and merchants to the furthest reaches of the known world to source metal (the money of the time) to drive economic growth, materials transferred through trading ports in a chain (where possible using more secure islands that were easier to defend, often with their own metal mines) connecting the extreme of the British Isles through trading ports to the Med all the way back to the Cyclades trading hub: that connecting Europe, Asia and Africa. By example Lapis Lazuli coming in from Afghanistan to Phoenician ports over the silk road. The islands converting these raw materials into high value export goods being the workshop of the world (producing weapons, tools, fine cloth and art). Each colony after establishing itself over many generations sending out further expeditionary missions to extend the network. The ships don't have to sail huge distances, they simply move goods between ports, the elite ruling class often having a common ancestry and strengthening trading ties through marriage. The Med being critical, you have what is known now as reverse haul logistics [supplying to and picking up to the next trading port (and importantly you can utilise natural currents – that explains the iconography on frying pans and the Newgrange entrance stone, pilot a course clockwise to inner islands and anticlock around the coast of the mainland, this is how the currents in the Med actually work]. This network collapsed when Thera erupted and ushering in a dark age that set the world back two millennia. They were approaching a technology watershed but never transitioned to an entirely new age. They had all the ingredients of in many respects a near pre-industrial revolution: steam. advanced architecture, were adept engineers, had sophisticated financial instruments, the division of labour and trade specialisms, a scientific approach, exquisite art, both decimalised and fractional sexagesimal mathematics (including trigonometry, at least a Palace apprentice programme and basis for a learnt 'educated' society). STEM with Art: STEAM; or almost. They had everything and a pioneering spirit to find more, then Thera erupted. It is interesting that the Thalassocracy empires throughout recorded history may be connected by ancient trading links, and shared/ transferred knowledge/culture and to a degree bloodlines. Minoans&gt;Phoenicians&gt;Iberia Celts (Spanish)&gt;Vikings&gt;Britain. It would explain Brits interest in exploring the world, discovery and inventive nature. All these cultures have a common iconography stem going back to prehistory: the twin snake entwined around the axis of the world, to navigate the same. They knew the earth rotated once about its axis each day, why the length of day and night [underworld] changed as the world rotated around the sun once a year, they even understood how the cycles of the moon interacted with the earth and could predict eclipses, they studied this over millennia. They had a profound respect for and knowledge of the cycles of the natural world. The Antikythera mechanism didn’t 'come from nowhere', it was based on Minoan knowledge derived by trading with, acquiring and utilising the knowledge of the world. Protected from the warring mainlanders by sea and having a capable merchant navy, all the sailors could fight often with a small unit of Carians in the crew, the modern-day equivalent of marines/SBS, very good at board and secure, e.g. the manifest of [wrong coloured flag/sail]. Things haven’t changed that much. Go find it: its all recorded in the artwork and archaeology! The Minoans were culturally distinct from Mycenaeans before the demise of the Minoan trading empire that may be recorded on this seal stone. Site search: " stunning-Minoan-gemstone-owned-bronze-age-warrior-rewrites-history-ancient-021703 "
1. The demise of the Minoan empire was triggered by the Thera eruption, this lead to global crop failure, recorded as far east as China and almost certainly the loss of the naval/trading fleet through tsunami., decimating every port in the med. After rebuilding tports and ships they focused on closer trading links, with metal reserves (built up over centuries) running out. The lose of a critical redistribution trading hub (Thera) resulted in diminishing economic return that they could not recover from and were sufficiently weakened for Mycenaeans to consider an invasion. Added to this mayhem Tin was not coming in from Iberia (or the onward trading network to Britany), that powered the Bronze age Mediterranean economy, leading to war across the region and every kingdom scrambling for anything they could acquire from other lands and the sea peoples (that may have had a health Minoan heritage) raided trading ports too. See: The Theran eruption and Minoan palatial collapse: new interpretations gained from modelling the maritime network. Carl Knappett et al. 2. The Minoans enjoyed peace at home upon their islands but were not peace-loving persay. At their zenith, had a navy that was the envy of the rest of the world! They suppressed piracy (and possibly other Kingdoms sea trading activity) to support their own trade monopoly! It is also likely that they provided and paid mercenaries to supplant unfriendly kingdoms on the mainland to support trade. 3. The quality of Minoan craft and engineering fell off with Mycenaean invasion. It is a two-way exchange as you suggest, the quality of Mycenaean art and technology increased, but the supplanted Minoan colony (now Mycenaean) decreased to a similar level. Riley, I have a hunch, Linear A may be deciphered using ancient Gaelic, through the Iberia trade network! There may be loan words that that transferred, the Linear A tablets largely record commodities and skills (metal, oil, wool, flax, cotton, wine, honey, slaves, weapons, mercenaries) so why not start there and look for loan word precious commodities that may be exchanged. There is archaeological evidence and art that supports this: Newgrange mound – see entrance stone (there are a string of similar structures through the islands between the British Isle, Spain all the way to the Med). The Celtic Triquetra and Minoan (Archimedes) spirals on pottery are exactly the same! There is a merchant grave in Cumbria (linking Cornish tin with Scotland) the inside of the stone tomb is covered with rebates for casting double axes (used for navigation and keeping time), the Druids and Minoans both studied the stars and celestial bodies, they seem to have a similar calendar and culture! Minoan DNA has ancient Albion origin (the highest concentration compared to anywhere else in mainland Europe). There appears to be very ancient trade between Britain and the med, through Iberia (that became Celts), the invasion of Ireland seems to record the establishment of expeditionary colonies to access precious metals (exporting Tin in particular, copper, Jet and amber and probably importing gold and other trade goods from the med/Iberia) . Happy treasure hunting!